You heard that Google Apps would make life easier, so you signed up. After all, it's free for education and non-profits, and surprisingly affordable for businesses. But where do you go from here? We'll show you five easy steps to getting the most out of Google Apps. If you really want to maximize Google Apps, it's time to get in sync. It's as simple as entering your Google login credentials to your smartphone, tablet, or laptop. This enables you to check the Google ecosystem from any location and see updates as they happen. Want to invite a colleague to a business meeting? Do it from your car and they'll receive the calendar notification within seconds. Need to collaborate on a shared file? Chat right in the document, leave comments, or share with a non-Google Apps user. Syncing is a simple step that will make team communication a whole lot slicker. Trello - This handy project management system is simple to learn and implement, even for the less tech-savvy. We've replaced our physical scrum boards with Trello's digital cards and easily-managed columns. UberConference - Turn painful conference calling into a relaxing experience. UberConference lets you record your calls and immediately see who's joined and who's talking. Best of all, you don't need a PIN to use it. SmartSheet - For complex tasks, SmartSheet is just the ticket. Users can import a spreadsheet and turn it into a list of tasks and sub-tasks. With one click, you can generate a Gantt chart or calendar to display due dates and progress. Lucidchart - Both Forbes and InfoWorld named us one of the most popular apps for business. The latter wrote, "Creating flowcharts, diagrams, and other data visualization often means making an investment of nearly $600 in a copy of Microsoft Visio...Lucidchart covers all the diagramming basics for free, and for just a few bucks a month you can access extra features such as mind maps, mobile app wireframing tools, and version history." 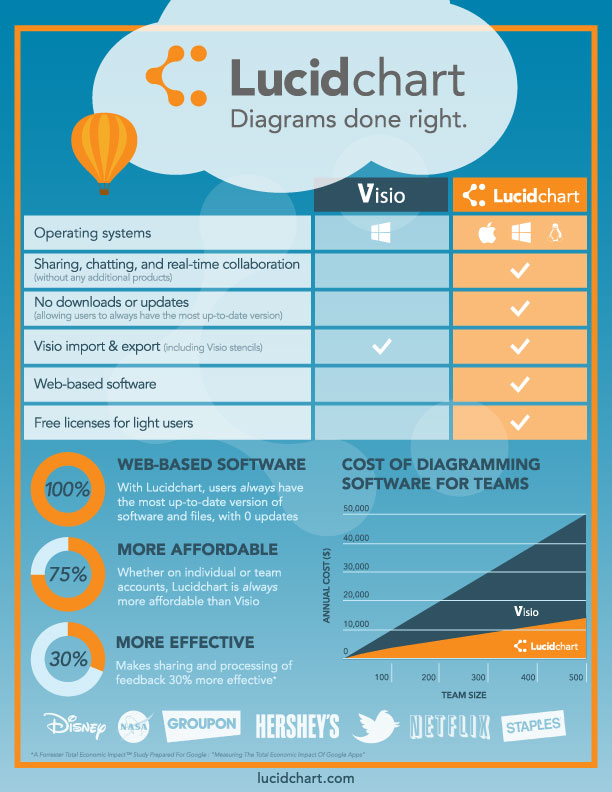 Using an app like Lucidchart over the traditional standbys—Visio, in this case—can save your organization up to 75%! When you implement a suite of cloud-based tools, it's easy to see the savings stack up. Where are you currently storing your files? SharePoint, email, a rickety filing cabinet with long-lost keys? Stop the madness and just use Google Drive. It allows users to create, edit, and share documents from one central location. Drive not only offers a full-fledged suite of office tools, it features a cloud storage center that's perfect for storing photos, high-definition video, and legacy docs from programs you no longer use. With Drive, you can open file types in the browser, even if the corresponding program isn't installed on your device. A lot of people have griped that Google Drive's office tools—Spreadsheets, Presentations, Documents, and others—aren't as sophisticated as they should be. It's a fair point. The makers of comparable tools like MS Office have had years to perfect their interface, while Google's products are relatively wet behind the ears. But as Google releases key functionality that appeals to a broader market, we're certain that more and more people will leave Office behind. The Marketplace has handpicked top-of-the-line tools for your business; all you have to do is choose your favorites. Your company can also manage users and track data from the admin console—which is now available on Android devices. With built-in perks and useful third-party apps, there's no better time to go Google. Share your best tips for new Google Apps admins in the comments!